This “monomyth” can be viewed as the fundamental structure upon which myths from all around the world were built. In other words, it is human storytelling distilled to its purest essence. Hayao Miyazaki’s animated film Princess Mononoke (1997) follows this “monomyth” almost to the letter. A young prince named Ashitaka is forced to leave his village after it is attacked by a demon boar god and he is infected with the beast’s corruption. He journeys west in search of the source of the demon’s taint and a cure for his sickness. 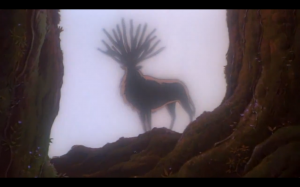 Ashitaka discovers a terrible battle between mankind and the gods and goddesses of nature. With the help of San, a human girl raised by a wolf goddess, they stop the fighting and return balance to both sides. 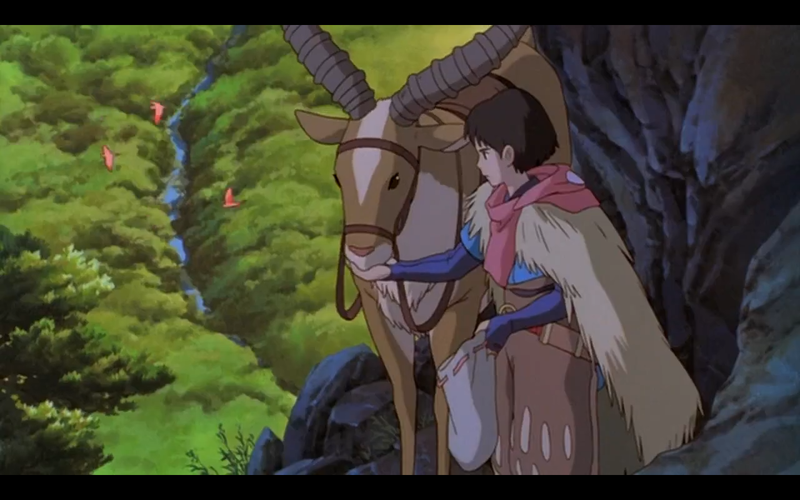 Though Princess Mononoke is an embodiment of the “monomyth,” its story is not generic or contrived. Indeed, much like George Lucas’ Star Wars (1977), it uses the “monomyth” as a springboard to create a fresh universe where the forces of magic and science share an uneasy co-existence populated by memorable characters, stunning locations, and stories whose apparent simplicity hide sweeping themes. 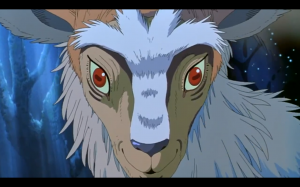 But if Star Wars was set in a galaxy far, far away that hosted a Manichean battle of light versus dark, good versus evil, Princess Mononoke takes place in mankind’s distant past where the struggle between the natural world and the realm of civilization out-weighed any concerns toward morality. 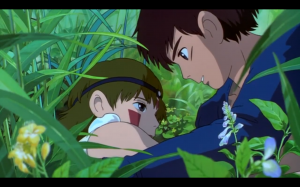 Miyazaki, who through an illustrious career has established himself as one of the world’s greatest animators, has repeatedly stated that he is not interested in creating harsh divisions between “good” and “evil.” Instead, his characters are usually a blend of the two. The leader of Irontown, the community responsible for clear-cutting the forest for ironsand which led to the imbalance in the natural world, is a woman named Eboshi. Although ambitious and willing to literally wage war on the gods, her community is populated by rescued prostitutes, lepers, and social rejects who had nowhere else to go. The victimized forest spirits are violent, arrogant, and willing to sacrifice themselves en masse in their fight against Eboshi. Their suicide attacks draw disturbing parallels to the kamikaze pilots of World War Two, a reference that could not have been unintentional considering Miyazaki’s hatred for Japan’s actions during that war. The Great Forest Spirit, a giant deer that transforms into a daidarabotchi at night, massacres countless humans after its head is shot off by those who want to use it to gain immortality. But its killing is not vengeful. It sweeps over the countryside looking for its head like an indifferent typhoon, neither seeking out victims nor actively avoiding them. Those familiar with Miyazaki’s more child-friendly films like My Neighbor Totoro (1988), Kiki’s Delivery Service (1989), and Ponyo (2008) might be shocked and horrified by the level of graphic violence in Princess Mononoke. 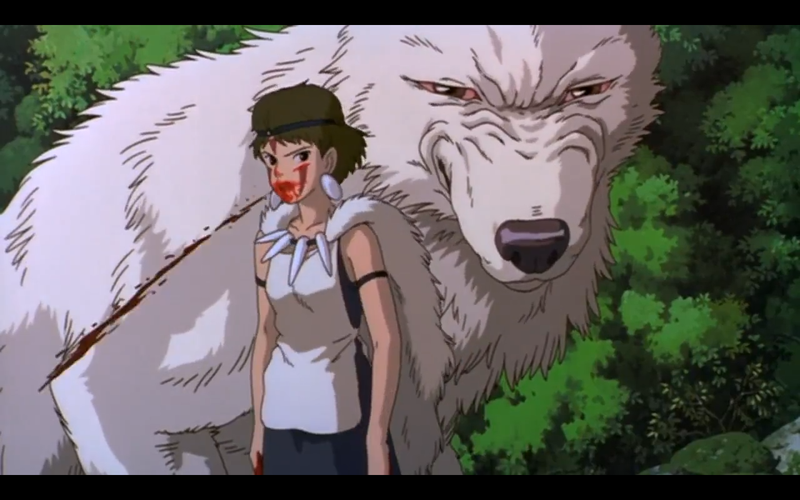 It seems almost unthinkable that the man who lovingly animated Mei Kusakabe bouncing up and down on Totoro’s stomach was the same one who drew sequences where Ashitaka decapitates numerous enemies with arrows, San spits mouthfuls of blood sucked from the wounds of her wolf goddess mother, and a crowd of fleeing Irontown refugees is annihilated by a tidal wave of Great Forest Spirit ichor. 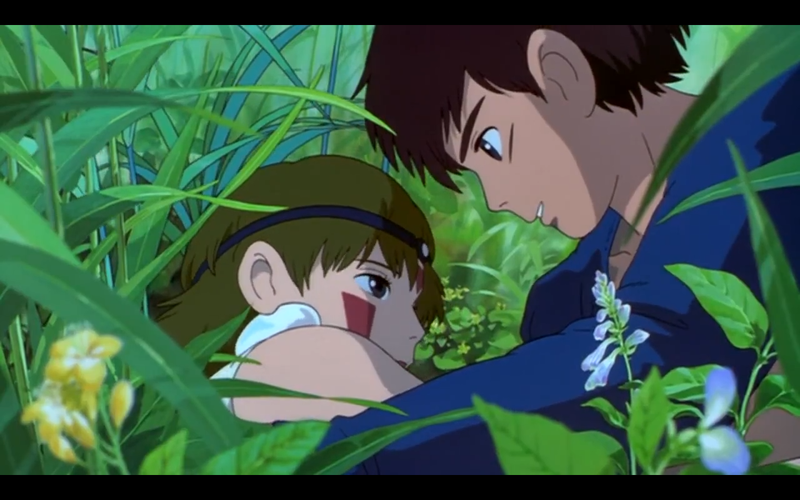 But it is the same man nonetheless; the same man who painstakingly oversaw all 144,000 of the film’s animation cels; the same man who dreams of forest spirits, fairy tales, and flying; the same man who believes that perhaps love, whether between two lovers, two siblings, or an entire family, may be the single greatest force for peace and balance in our uncertain world. Previous ArticleNews: Echosmith Releases New Music Video for "Cool Kids"